"Gingko trees bordering Alexander Mack dedication plaque, late 1990s" by L. Michael Hill Ph.D. 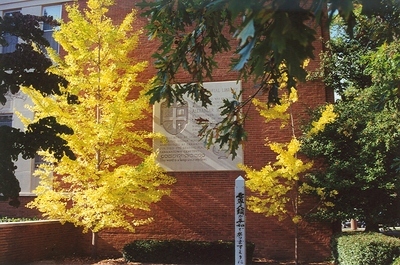 The portion of the Library that honors Alexander Mack is bordered by two Gingko trees, Ginkgo biloba (Ginkgoaceae). I personally lobbied for the placement of Ginkgos on campus and was happy to see the good result, late 1990’s.